The top Senate Democrat is using marijuana’s informal holiday to announce a change of heart about the drug, another sign of the growing political acceptance of pot. Senate Minority Leader Chuck Schumer of New York said Friday he’ll introduce a bill taking marijuana off the federal list of controlled substances — in effect decriminalizing its use. His bill would let states decide how to treat marijuana possession. Under the measure, the federal government would still enforce laws against moving pot into states where it’s illegal and would still regulate advertising so it isn’t aimed at children. Schumer said he also wants to ensure that minorities and women have a fair shot at getting involved in the growing marijuana industry and that the federal government invests in research to better understand the drug’s health effects. 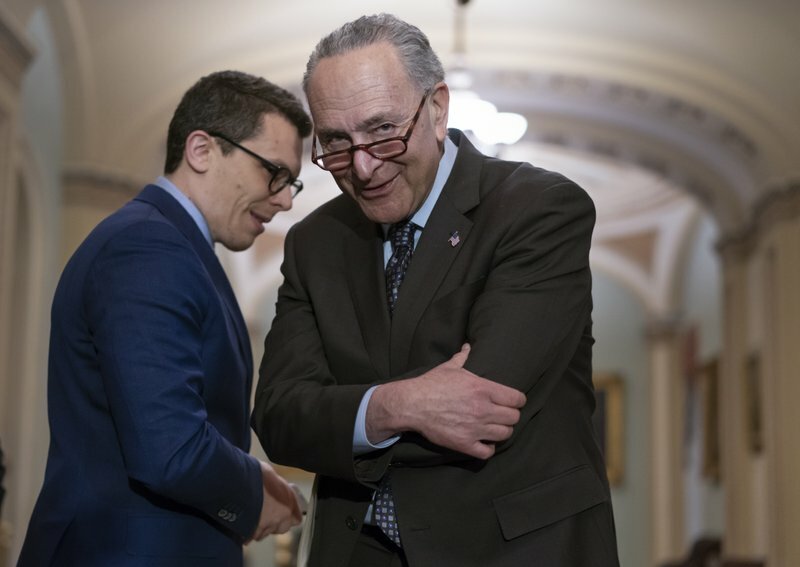 “My thinking, as well as the general population’s views, on the issue has evolved,” Schumer said. Schumer unveiled his new position on HBO’s “Vice News Tonight” where he was asked whether he had smoked pot before. “No,” he replied. Would he like to try? “Well, as you pointed out maybe I’m a little old. But, who knows? Who knows?” said Schumer, age 67. Schumer timed his announcement to April 20, or 4/20. That’s the numerical code for marijuana’s high holiday, an homage to pot’s enduring appeal and universal slang for smoking. Schumer’s new stance could be a smart move politically. Democrats are trying to do a better job of connecting with young voters, hoping to drive them to the poll in November’s mid-term elections. Americans’ support for marijuana legalization has been growing in polls with Gallup’s most recent update in October showing that 64 percent of Americans were in favor of legalization. Former U.S. House Speaker John Boehner also announced recently that he had changed his stance on marijuana and that he would promote its nationwide legalization as a way to help veterans and the nation’s deadly opioid crisis. Boehner, an avid cigarette smoker, has joined the advisory board of Acreage Holdings, a multistate cannabis company. That’s a slight improvement from the previous Congress when legislation from Democratic Rep. Jared Polis of Colorado, calling for marijuana to be treated like alcohol, gained 19-co-sponsors in the House. The House also has its own “Cannabis Caucus.” Four lawmakers started the group last year to keep federal policies from interfering with states as they enact laws allowing for recreational or medical marijuana. Rep. Earl Blumenauer, D-Ore., and one of the group’s founders, issued what he called the Cannabis State of the Union on Friday. He said that ballot measures are “poised for success” in Michigan, Missouri, and perhaps Utah. He said advocates for medical marijuana in Texas are organizing and optimistic about their chances for success in the 2019 legislative session in Austin. “The wind of public opinion is at our back,” Blumenauer said.